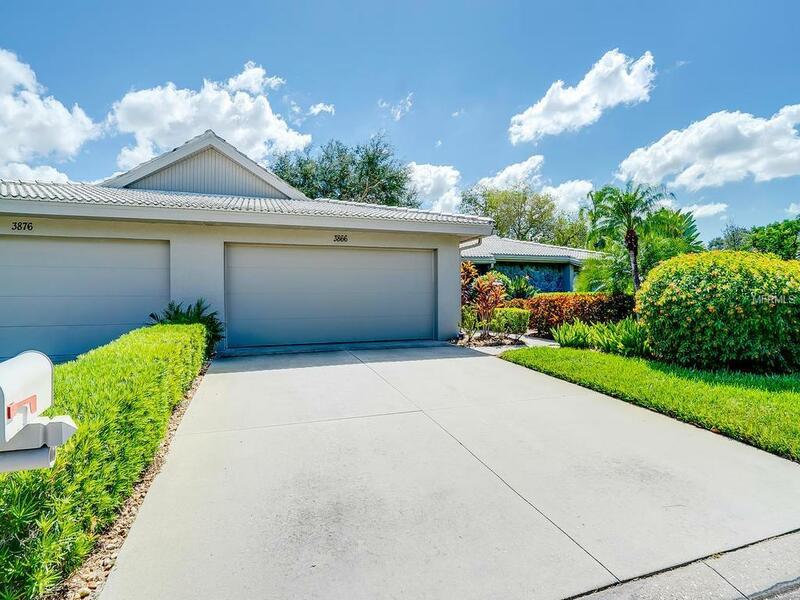 Looking for the ideal 2/2/2 Sarasota home for either full time or part time living. This move in ready villa is only minutes from Siesta Key but outside of the flood plain. Totally updated with a fantastic view of a lake, foliage and wildlife. 2 huge bedrooms, 2 full baths, a living/dining area with a wood burning fireplace and facing out on both sides to 2 screened lanais, a large kitchen/family room with built ins and a bar. Slider opens to the garden screened in lanai, plus there is a screened in entry way. Plenty of closet space and large pantry. Oversized 2 car garage. Over $60,000 in upgrades added including new faux marble floors, quartz counters, light wood cabinets, pavers lighting and remote control fans. See through hurricane shutters are included as are all appliances including new door in door stainless fridge and steam clothes dryer. This villa is located on an oversized lot with a large open green space to the right. Steps away from the Lakeshore Village South pool. Lakeshore Village South is located in the heart of Sarasota and is close to shopping, beaches, medical offices, places of worship and cultural activities and theaters. Optional social membership for $150 a year in Lakeshore Village which allows access to 2nd pool, clubhouse, tennis courts and many social activities. Active 55 plus community. Pet allowed in this section. Pet Restrictions 2 Cats Or 1 Dog. A Dog Kept in Any Unit May Not Exceed 15" in Height At The Shoulder At Maturity.